Photo by greeter Kaylene Derksen. 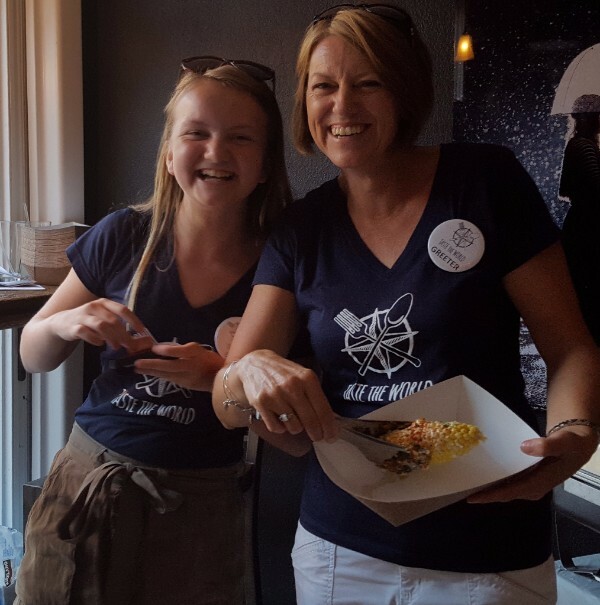 At each of our Taste the World walking and sampling tours, we need up to 40 friendly, helpful greeters! The greeters are the ones who help create the welcoming atmosphere at each of the participating restaurants, and provide continuity of experience for participants. We can't hold these events without greeters! In exchange for about two hours of welcoming guests, stamping passport tickets, serving food, and answering questions, greeters receive a free ticket to the event. We have two greeters per shift at most restaurants. One must be at least 16 years old, the other can be 10 to 15 years old (with some younger exceptions if we get in a bind). Note: for the Central Market Breakfast Tour, there will only be one adult greeter per stand (due to space constraints). Here is information for the February 9 Central Market Breakfast Tour. Details and sign up for later tours in the 2019 season will be available in the spring. To greet at the February 9 Central Market Breakfast Tour, please download and read the detailed Instructions for Greeters - Central Market Breakfast Tour. A copy of these instructions will be in the supplies packet, so you don't need to print and bring a copy. I want to be a greeter! Select all dates/shifts for which you are available. The hours indicate the time that you will be greeting, plus picking up supplies (for Shift 1) and returning supplies (Shift 2). The tours are from 5 to 8 p.m.
What phone number can we use to reach you the evening of the event? Type in the name of the person who gave you this web address. Submitting this form does not guarantee a greeting assignment. We reserve the right to select and refuse any greeter applications. We will confirm your participation before the events for which you are selected. Thank you!